Voodoo Vibes is inspired by the voodoo culture, the Video Slot has a wild symbol, scatter symbol, free spins and an interactive bonus game with different animations. Voodoo religion is wrapped in mystery and intrigue, it is so unique and ancient that people are fascinated by it, just like this video slot. This online casino game has a maximum bet per spin of 50 euros played over 4 bet levels, 25 bet lines and with multiple coins to choose from. Update: unfortunately Voodoo Vibes is no longer available. The Voodoo Vibes bonus feature game sees you playing with voodoo dolls sitting on a shelf. There are 12 of these dolls and you have a pin to stick in them one by one to reveal the coins they hide inside. Once you prick a voodoo doll that has no coins inside it is back to the main game to carry on spinning the Voodoo Vibes reels. The Free spins for this video slot are activated by three or more scatter symbols, appearing randomly on the reels of the main game. 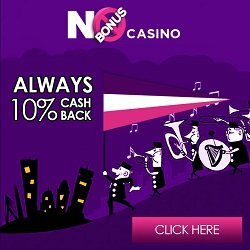 10 Free spins are awarded that pay out triple the amount of the bet lines. Wild substitutions are also in full gear for this online casino video slot. They will take the place of all symbols except for bonus and scatter symbols. The symbol for the wild in this game is a voodoo man. All the symbols have different values, which also differ from if you get three four or five i na bet line. Good luck with this original online casino video slot.